We are eating more sugar than we think and experts are warning that sugar may be the worst thing we could be eating. With new recommendations out this month from the World Health Organization (WHO) suggesting we cut our sugar intake in half, it’s becoming clear that we need a sugar solution. Sugar is addictive so it is not realistic to cut it out sugar completely. Sugar triggers a pleasurable and captivating sensation in the body that can become addictive. Scientifically, that delectable high we feel when we consume sugar is caused by the creation of dopamine, which our brain associates with reward and motivation. Studies show the same hit of dopamine caused by drugs of abuse occurs when we binge on sugar. It is no wonder we love sugar – it can be addictive. Eating sugar tastes great and feels good. However, it causes chaos in our body. Sugars are quickly absorbed by the body and cause a rapid and high spike in blood sugar. High blood sugar damages capillaries (small blood vessels such as those in the eyes, fingertips, kidneys). To lower blood sugar, the body has to rapidly produce a lot of insulin. Over time, cells begin to stop responding well to insulin, and lead to diabetes. The Nurses Study, which followed over 75,000 women for a decade, found diets that cause high blood sugar levels are linked with a high risk of coronary heart disease. Researchers and health professionals have also voiced concerns that eating high amounts of sugar also causes weight gain. First, it helps to identify where that sneaky sugar is hiding. 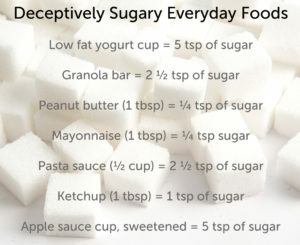 It is going to surprise you – how much sugar is in some of your favourite foods, even some foods you consider ‘healthy’. 33 percent of the mayonnaise is sugar. a low-fat yogurt cup contains more than 5 teaspoons (20 grams) of sugar. one cup (55 grams) of Shreddies™ has 9 grams (16%) of sugar. How much sugar are we eating? In 2014, the average Canadian consumed about 26 teaspoons (110 grams) of sugar a day, according to Statistics Canada. New guidelines released by the WHO on March 4 suggest that we eat no more free sugar than 10 percent of our daily energy intake, and better yet, aim for 5 percent (that’s about 6 teaspoons or 25 grams). To put that into context, a can of soda pop contains 9 teaspoons (37 grams), and a half of a cup of packaged pasta sauce contains 2.5 teaspoons (10 grams). It is important to note that free sugar is sugar added to foods, not the sugars found inside fruits or vegetables. The move by the WHO is a step in the right direction given the high percentage of people with health conditions that are related to eating too much sugar, such as childhood obesity and diabetes. There is power in educating people and offering them guidance as such we nod in approval to the WHO’s efforts. By knowing what is in your food, you can make healthier choices – you can take control. You can take control of your health by identifying where sugar is hiding and then make a ‘Healthy Swap’. Most importantly, eat a whole food diet. Whole food diets are well supported for their ability to reduce the risk of disease, including diabetes, and maintaining a healthy weight. A whole food diet is rich in fresh foods in their whole-state (not processed). Many whole foods contain complex carbohydrates (e.g. nuts, seeds, vegetables, fruit, whole grains) that help control blood sugar levels. Foods with complex carbohydrates have low glycemic loads (do not cause large increases in blood sugar levels). There are many forms of sugar. Most of us think of sugar as the white crystals we add to tea. Sugar is also in many foods from fruit juice to maple syrup. Yet, the sugar we do not notice we are eating is hidden in prepared or processed foods. 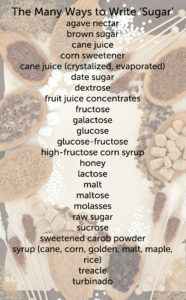 Looking for sugar on food labels goes beyond looking for anything ending with the letters “ose” (e.g. sucrose, glucose). 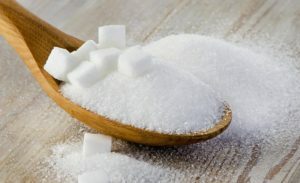 There are many ways sugar can be written on food labels: glucose-fructose, dextrose, evaporated cane juice, fruit juice concentrates, malt and rice syrup. Food packages also include claims about their sugar content that can be hard to decipher. The claims “sugar-free” or “sugarless” mean a food contains less than 0.5 grams of sugar per serving. “No added sugars” means the food contains no added sugars such as concentrated fruit juice, glucose or fructose. If a food package has the claim “unsweetened”, then it contains no added sugars or sweeteners (aspartame, sucralose). As for the claim “low in sugar”, it means the food contains at least 25 percent less sugar when compared to a similar product. Many products that are labeled as “low in sugar” contain artificial sweeteners such as saccharin, aspartame, sucralose and saccharin. Artificial sweeteners are commonly used in processed foods to increase sweetness while keeping calories low. The public generally views artificial sweeteners as a good choice for weight loss. However, according to an animal study published in the 2013 issue of Appetite, both saccharin and aspartame induced greater weight gain than sucrose (sugar). It is thought that artificial sweeteners may interfere with the body’s ability to properly balance energy intake, ultimately causing weight gain. Since it is not realistic to cut sugar out completely, give natural sweeteners a try. There are many to choose from including stevia, palm sugar and pure maple syrup. Some natural sugar alternatives do not elicit as high of a blood sugar roller coaster as conventional white sugar (sugar cane). For more detailed and personalized help with sugar, myWholeLife.ca has created the Blood Sugar App. Winner of the Top 10 AppRx Award in 2014, this app is not only easy to use, it also offers very effective help that has earned it the claim ‘Doctor Recommended’. It contains simple and practical strategies for maintaining blood sugar through food, lifestyle and more. Want to read more on sugar? Check out this great read, Should You Quit Sugar? Swithers SE and TL Davidson. A role for sweet taste: calorie predictive relations in energy regulation by rats. Behav Neurosci 2008 Feb; 122(1):161-73. Morgan RE. Does consumption of high-fructose corn syrup beverages cause obesity in children? Pediatr Obes 2013 Aug;8(4):249-54. Bray, GA. Energy and fructose from beverages sweetened with sugar or high-fructose corn syrup pose health risk for some people. Adv Nutr 2013 Mar;4(2):220-5. Langlois, K and D. Garriguet. Sugar Consumption Among Canadians of All Ages. Statistics Canada, 2014. Fernanda de Matos, F. et al. Saccharine and aspartame, compared with sucrose, induce greater weight gain in adult Wistar rats, at similar total caloric intake levels. Appetite 2013, Jan;60(1):203-207.